This photograph has a quality of the past but is a moment of the present. It is unexpected and makes the viewer ask, “When was this photograph taken?” I made it during a photography workshop that I was teaching that focused on outdoor portraiture. A photographic portrait should reveal an essence of the subject. It should demonstrate his or her authenticity—not as a person posing, not just as a paid model. It should reflect a real sense of who the subject is inside. That’s one reason I appreciated being able to make this photograph, because it revealed something important and essential about Anthony Parker, the subject. Anthony Parker is a performer—a professional actor and a champion powwow dancer. He is also a father, a printer, and a friend. He’s in and out of New Mexico because of his movie career, so my students and I were blessed to have this opportunity to work with him and to learn the importance of tradition, history, and culture to him. He’s not just a man dressed in Native American regalia. Anthony created much of his own outfit and can teach the meaning and symbolism behind it. He knows the history of his culture and has every intention of keeping that culture alive. Anthony says he is a performer, but this image is not of a performance. This was a natural moment of his reality and of Buck’s, the dog. 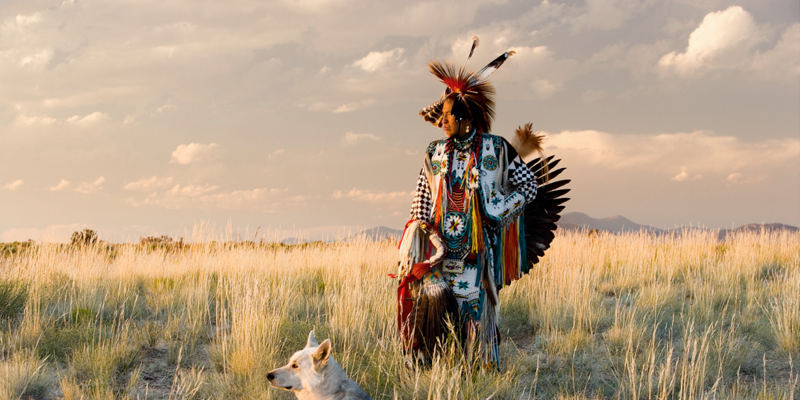 Everything in this image is connected; there is a strong relationship between the man and the dog and their environment. The light, the grasses, Buck, and Anthony all belong together, but not because of the camera. They are living outside of time. When I produce a print, either digitally or in the wet darkroom, I too, want to share a sense of what it was like when I made the photograph. I must look at the “performance” in the darkroom or on the computer screen to see whether it harmonizes with what I felt and want to share. For example, when I made this photograph, the light was palpable. I felt I could touch it. It existed together with Anthony, Buck, and that endless horizon. But back at the studio, when I looked at the raw digital file, I found that the camera had not recorded the palpable quality of the light that day. The image was only of the man, the dog, and the landscape. 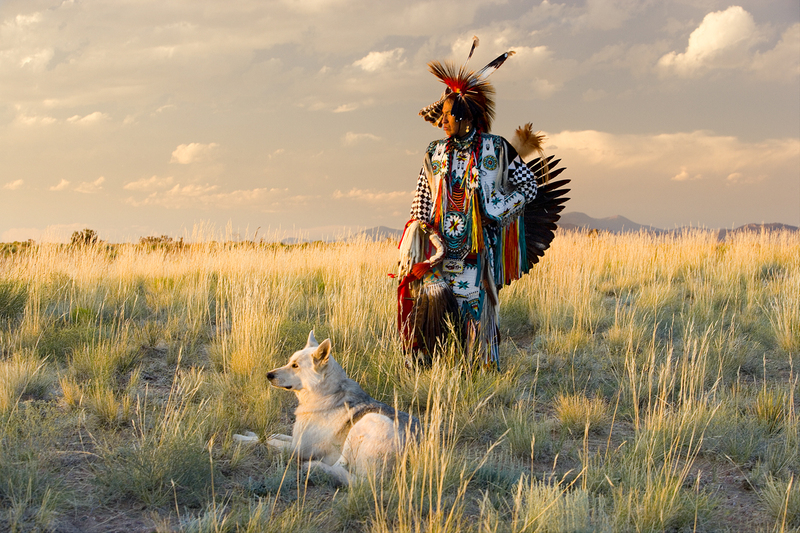 I had wanted to express in my photograph the completeness of that moment when man and dog were paired with land and light. So to make that light evident in the photograph, I enhanced the sky with a Nik Color Efex yellow-orange digital photographic filter. I wasn’t trying to change the image, add or take things out, or create a mood that wasn’t appropriate. I wanted to share what I felt. In my work, any image manipulation must be invisible. If the viewer can tell that I did something to an image—if I make it obvious—then I have gone too far, and the image will be unsuccessful. If I had made the sky in this photograph purple, for example, it would have been too obvious and thus distracting. I’m not against manipulating images. I think some of the work I’ve seen in which reality has been changed, such as computer-generated images in movies, is just amazing. But in my work, an image needs to be congruent with human vision. A viewer should believe in the reality of my photographs. The resulting image in this picture reveals the light I experienced that evening, which completes the photograph. The moment Anthony and Buck looked off into the distance was that perfect moment when light, environment, and perception connected—a reality too beautiful for words but revealed in the photograph. The Canon 10D was my first digital camera and I now primarily use my Nikon D-810. An excerpt from Four & Twenty Photographs: Stories from Behind the Lens by Craig Varjabedian. In my quest for those convergences of light and mood that define a great image, I have spent decades exploring the secret corners of New Mexico. The book reveals how an artist’s work, and his life, continually intertwine. You can sign up for my e-newsletter here or visit my web site at www.craigvarjabedian.com and learn more about my workshops through Eloquent Light Photography Workshops at www.eloquentlight.com. Words and images ©Craig Varajabedian. All rights reserved. A lovely shot. Warm, friendly, historical and very natural. A classic.